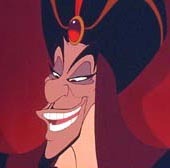 Jafar, the main villain from Aladdin is, without a doubt, a creep across the board. However, he seems his slimiest when drooling over Princess Jasmine, who has been trying to marry the entire film (however, he wishes to marry her mainly to become Sultan). Watching this creepy old guy lusting over the beautiful, young Jasmine is truly repulsive. However, it is not just Jasmine that Jafar lusts for. Being the Grand Vizier just isn't enough for Jafar anymore; he wants to rule Agrabah himself as well, and knows that all he needs to do to succeed is find a legendary magic lamp, provided he can find it. Enlisting the aid of a ragged street rat, how was he to know that Aladdin would be his ultimate downfall... or would it be his own lust for power? Claude Frollo from The Hunchback of Notre Dame. You could not discuss Lust in Disney without discussing Claude Frollo. The poster boy for "Disney Lust", Frollo has his beady eyes set on the voluptuous Esmeralda, a "burning desire" that haunts his very soul. He finally finds a use for his abused "foster son" Quasimodo, manipulating him into finding the gypsy for him, so he can burn her at the stake. What better way to show a girl you love her? Before burning her to death he gives her the option of death or being with him. Smart girl chooses death. Frollo, in my opinion, is one of the Disney's most heinous villains. Aside from his perverse lust for Esmeralda, his crimes include: Attempted genocide, manslaughter, attempted murder, attempted infanticide, abuse of power, kidnapping, wrongful imprisonment, and assault with a deadly weapon. Critical Responses to Aladdin and The Hunchback of Notre Dame. Aladdin was released in 1992 to favourable reviews. In the film, Jafar, Grand Vizier to the Sultan of the fictional kingdom of Agrabah, is attempting to access the Cave of Wonders for a magical oil lamp containing a genie. He and his talking parrot, Iago, learn that only the metaphorical Diamond in the Rough can enter the cave, or anyone accompanied by him. Jafar has a lust for power and will do anything, even kill, to obtain it. Though, as it is shown in the clip above, Jafar does lust after Princess Jasmine, the main thing he lusts for is power. However, when it comes to lust, no Disney character stands out more so than the super creepy Claude Frollo from the 1996 film, The Hunchback of Notre Dame. According to Wikipedia, Frollo is a ruthless and powerful judge who is Quasimodo's reluctant guardian. He is the main antagonist of the film. He also lusts after Esmeralda. Frollo generally does not see any evil in his deeds as he does them in honor of God, even though the Archdeacon often disapproves of his actions. 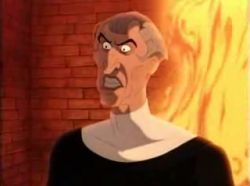 At one point during the song "Hellfire" though, the priests singing the Confiteor manifest as his conscience, chanting the Latin words "mea culpa" ("my fault"), to reveal that Frollo may know the truth of his actions. Lust is a craving for sexual intimacy, sometimes to the point of assuming a self-indulgent character. Lust, or a desire for the flesh of another, is considered a sin and when Frollo prepares to burn Esmeralda at the stake in front of the cathedral he offers Esmeralda a chance to live if she agrees to be his lover, proving his lust for her (as if the song "Hellfire" didn't). According to the article, "The Hunchback of Notre Dame: The House of the Lord" in The Gospel According to Disney, "Frollo is tortured by his lust for Esmeralda, an unrequited passion that curdles into obsessive hatred. In the song "Hellfire," the judge prays to be delivered from his sin, prostrating himself before a roaring fire, with a cross above it" (170). In this scene, Frollo is presented with two paths: the hellfire or the cross above. Frollo chooses sin, just as Jafar did, which ultimately leads to his downfall. At the end of the film, Frollo is about to murder Quasimodo and Esmeralda and he quotes a vague biblical verse: "And he shall smite the wicked and plunge them into the fiery pit! ", and as The Gospel according to Disney notes, "Just then, the judge falls to his own death [a pit of fire], in an act of divine intervention" (171).